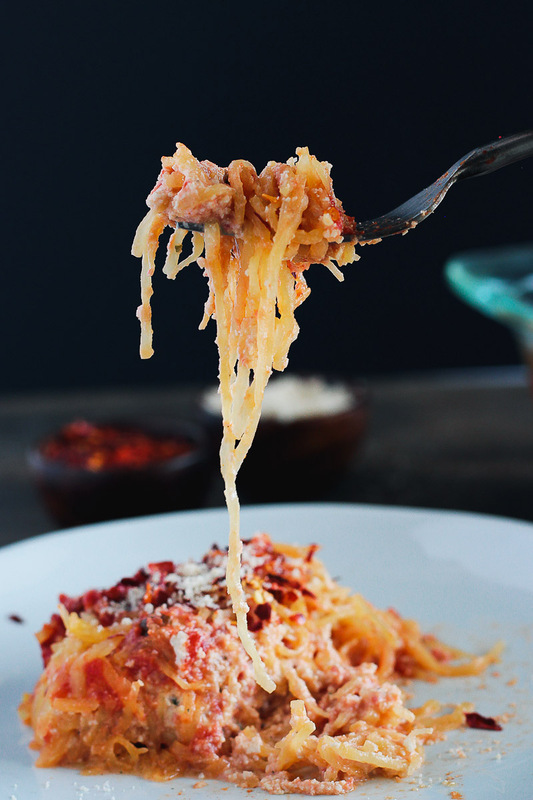 If you’re looking for a healthy alternative to traditional pasta, look no further than spaghetti squash. It resembles and tastes so similar to spaghetti, you have to give it a try. 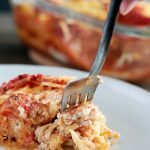 One cup of this Vegan Spaghetti Squash Lasagna contains about a quarter of the calories and carbohydrates from one cup of spaghetti made from semolina flour. Plus, if you use our homemade Vegan Almond Ricotta Cheese, you’ll save yourself the cholesterol too. The recipe is simple to make. Cut a spaghetti squash in half and scoop out all the seeds. Then, baste olive oil and sprinkle salt and pepper. Place cut-side-down on a baking sheet and roast at 425°F (220°C) for about 45 minutes. The spaghetti squash should now be soft enough that if you scrape it with the fork, you’ll get spaghetti-like shreds. The last step is to layer the spaghetti squash with vegan marinara sauce and vegan ricotta cheese. Bake for a little bit longer for a warm, hearty, comforting family dinner. I highly advise that you let the spaghetti squash cool down before scraping it. It is VERY hot. However, if you’re daring (and impatient) like me – make sure that you wear an oven mitt when handling the squash. We made this spaghetti squash lasagna before heading out for a short trip visiting family and friends in New York. It took us a lot of willpower to keep from eating it right away, but we knew that it would be worth it to wrap it up and have it for dinner after we got home from the airport. 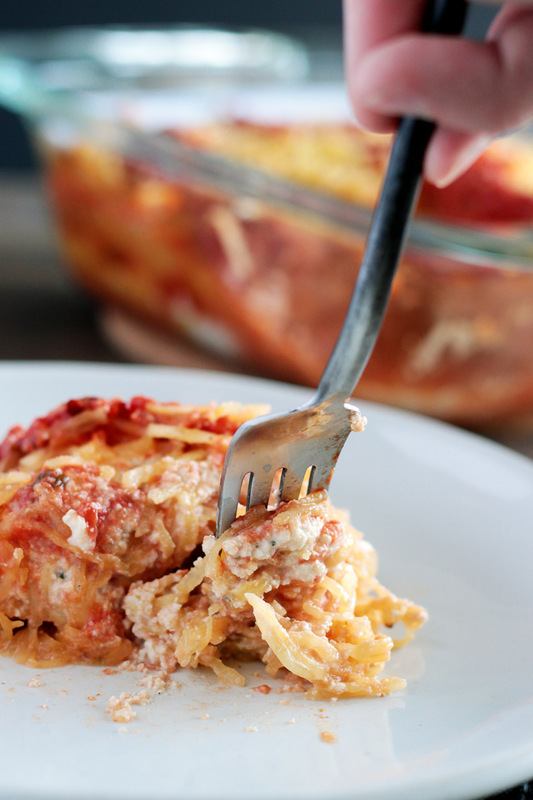 We couldn’t have been more right – having this vegan spaghetti squash lasagna waiting for us at home to pop into the oven so we didn’t have to worry about making dinner after traveling for so long was an AMAZING idea. It was the perfect homemade, comfort meal to welcome us home. Let us know in the comments if you make this recipe and don’t forget to tag @pastabased or #pastabased on Instagram too! A delicious healthy vegan + gluten-free spaghetti squash lasagna made with roasted spaghetti squash, homemade ricotta cheese, and tomato sauce. 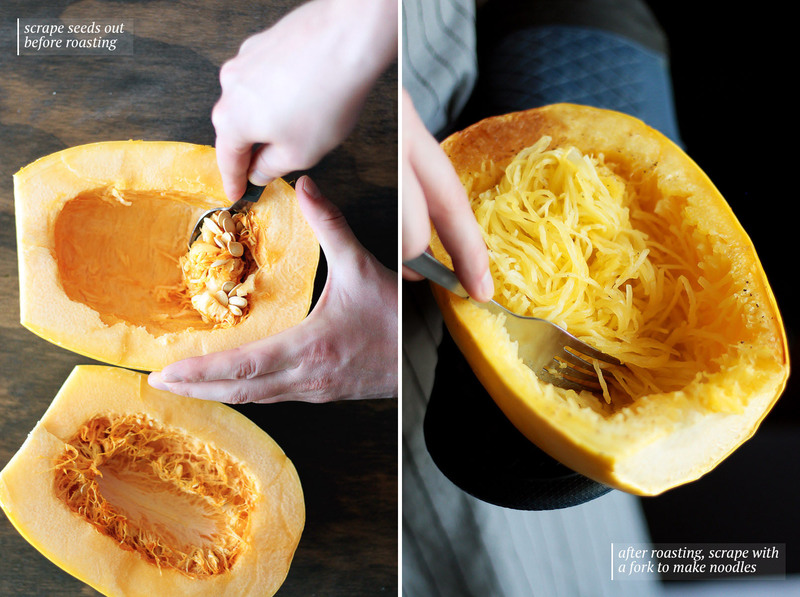 Using a large knife, carefully cut spaghetti squash in half. With a spoon, scoop seeds and discard. Baste olive oil on the inside of each half and season with salt and pepper. Place the squash flat-side down on a baking sheet. Roast in preheated oven for 40 minutes or until soft. Remove spaghetti squash from oven and lower oven heat to 375°F / 190°C. Let the squash cool slightly before scraping the inside of the spaghetti squash with a fork to make spaghetti noodles (see photo). 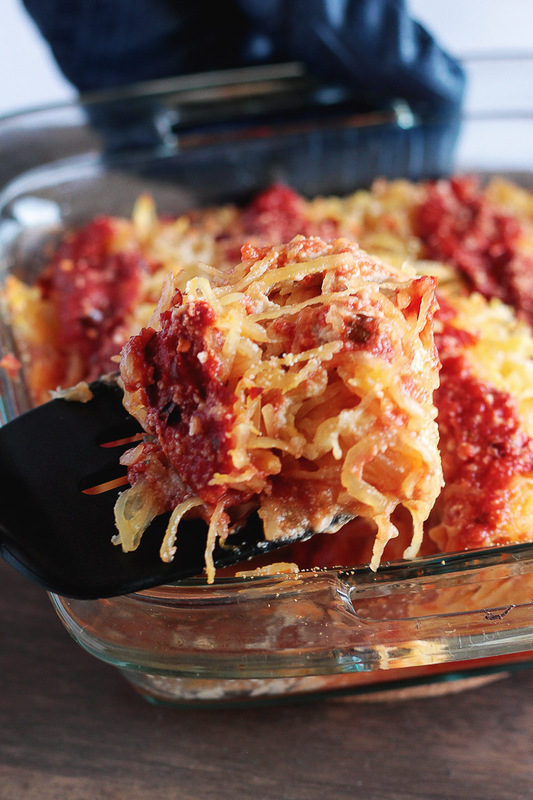 In a 9 x 9 oven-safe pan, add a layer of tomato sauce, then a layer of spaghetti squash noodles, and a layer of vegan ricotta (recipe instructions below). Repeat until all ingredients are used up (we had about 3 layers of squash, 3 layers of sauce, and 2 layers of ricotta in-between - ending with a layer of squash and some extra sauce for decoration). Cover pan with foil and bake in oven preheated to 375°F / 190°C for 20-25 minutes or until sauce begins to bubble. To make the vegan ricotta cheese. Measure slivered almonds into a large bowl and cover with hot water. Soak for at least 30 minutes, or until soft. Drain remaining water once done soaking. Meanwhile, press the tofu in a tofu press or by wrapping in paper towels and setting a heavy pan on top for 15 minutes, changing out the paper towels halfway through. Add all ingredients into a food processor. Pulse and process, scraping down sides when needed, until smooth and thick. Top with vegan parmesan and red pepper flakes. I made this for dinner tonight and LOVED it!! I made my tomato sauce with frozen tomatoes from our CSA and roasted my squash cut side up with some garlic in the “bowl” (which I chopped and added to the squash strands after roasting). I was concerned that the casserole might get mushy, but it definitely did NOT! I made it ahead and heated it in the oven for about an hour this evening. DELICIOUS. Thanks for a great vegan recipe!! I botched it and it still turned out good even w/o the garlic, yeast flakes and olive oil. I followed the recipe combining all ingredients including the marinara sauce (hello!). 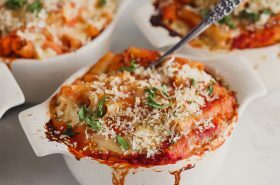 Recipe should read combine all ingredients except marinara sauce (for dummies like me?) I would probably leave out the plant milk (almond/coconut) as it was mushy but it still had good flavor. Will make it again. Thanks! Hahaha thank you for the comment! Glad it still turned out yummy.